I have tried gaming mouse pads in the past, most of which are Razer brand, but this is the first time I’ve owned a solid aluminum mouse pad. 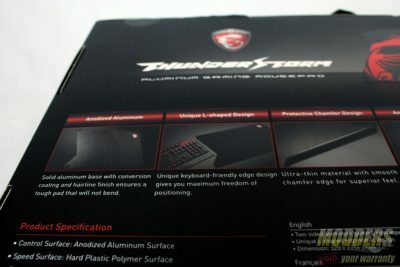 MSI’s ThunderStorm mouse pad has unique traits that help differentiate itself from other aluminum mouse pads on the market. 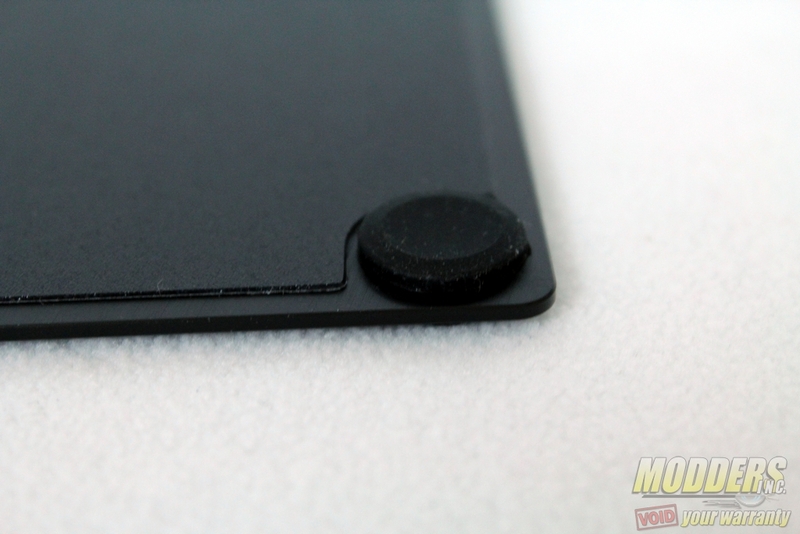 The most noticeable trait is the cutout on one side of the pad that is meant to accommodate the corner of a keyboard. This is was meant to save desk space. Another noticeable feature is the installation of rubber feet on each corner. The ThunderStorm is also reversible with a different texture on each side. 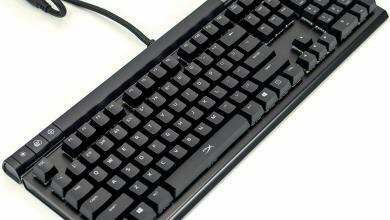 I could not wait to put my cursor on a solid piece of metal. 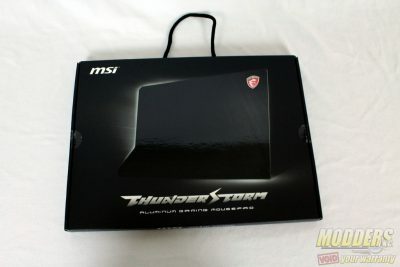 According to the packaging, the MSI Thunderstorm is “No.1” in gaming. 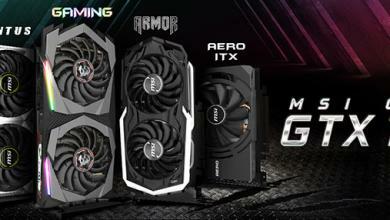 That bold statement shows MSI has confidence in their product. 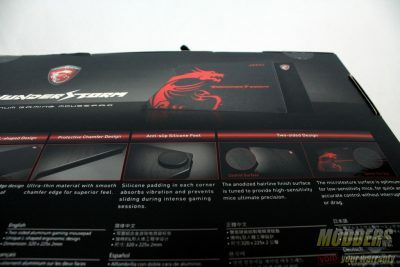 The box looks very clean and has a glossy finish over the image of the actual mouse pad on the front of the box. There is a thread protruding from the top that acts as a handle for the product box so it would be easier to carry to the checkout line. The rear of the box hold some basic information regarding the unique features offered for the mouse pad as well as some specifications. The Nitoflon adhesive tape is an interesting accessory. This is meant to make smoother contacts between the mouse and the Thunderstorm. According to instruction sheet, this is not a mandatory add-on, but is there in case the mouse has worn out or have poor quality feet. 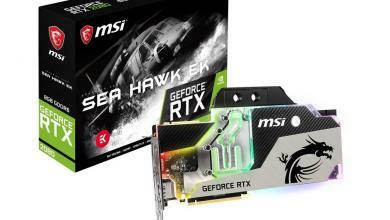 This is a way that MSI can have as much control as possible of a user’s experience of the mouse. The MSI Thunderstorm has also included a microfiber cleaning cloth which is used to clean the mouse pad once too much dirt or oil has landed on it. I would probably end up using rubbing alcohol or all-purpose cleaner and forget about the microfiber given the nature of the product. 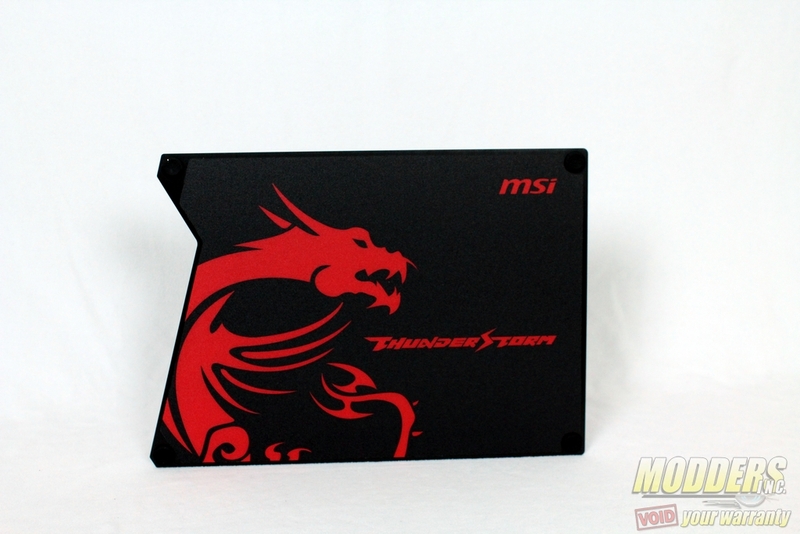 The feet of the MSI Thunderstorm will vary in shape depending on which side you are using. 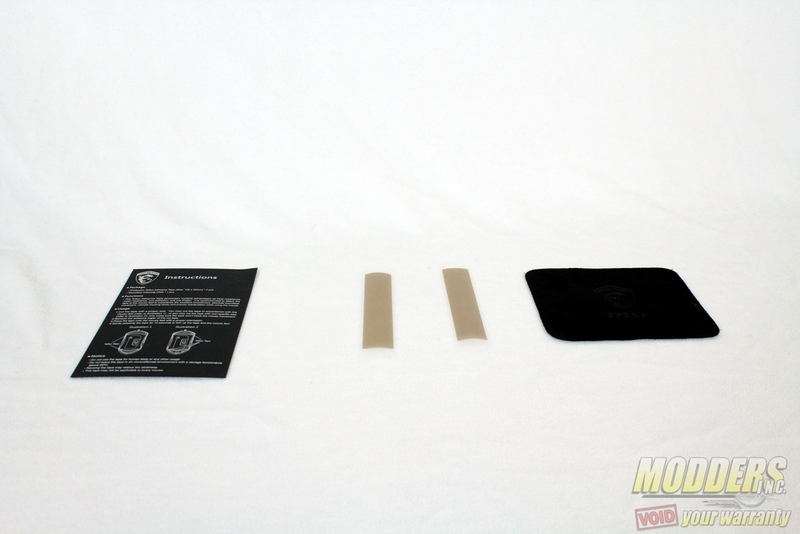 The “speed” side of the pad has a concave silicone shape while the “precision” side has convex silicone feet. It is not clear why there is a difference in shape, but I’m glad there were silicone feet since many other mouse pads would slide around unless I had a keyboard keeping the pad down. The silicone feet of the MSI ThunderStorm is not glued onto the mouse pad but is one continuous piece of rubber that goes through one end of the mouse pad to the other. 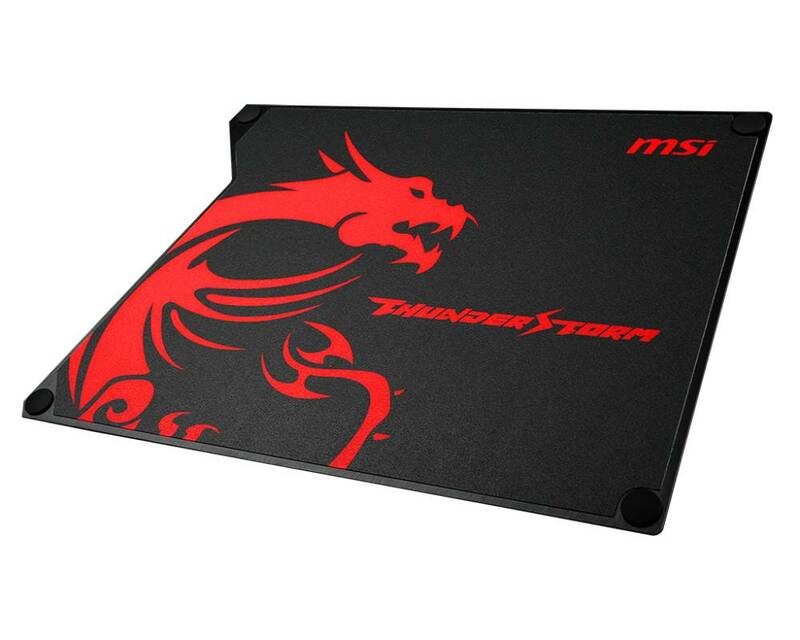 This type of rubber feet of the MSI ThunderStorm is much sturdier as the feet will not come off the mouse pad due to weakened or old glue. The feet can still be removed eventually if a user violently pushes the ThunderStorm during regular use as it is only rubber and will not be indestructible. The “control” surface of the MSI ThunderStorm has a hairline finish that will take advantage of any mouse that has a high dpi. 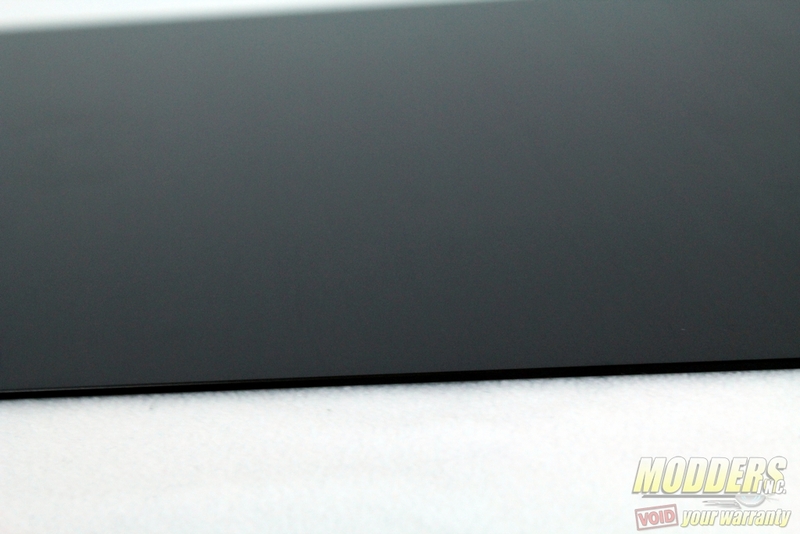 This is a nice cold surface and is a solid piece of aluminum. 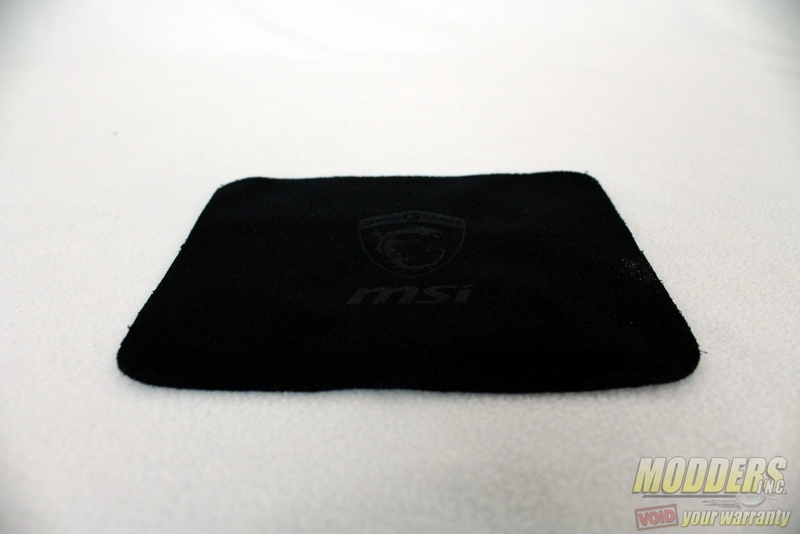 On the top right corner of this mouse pad there is a signature MSI gaming series badge. 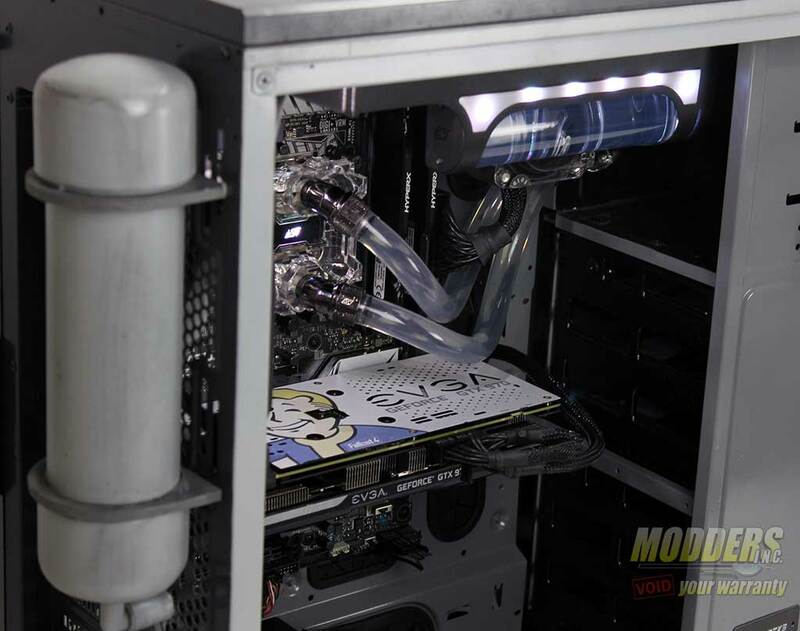 This a nice touch and is the side I prefer the most. 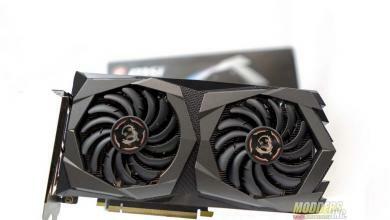 There is very little resistance on this side and I feel like I’m working on a more premium setup just by having a mouse pad that is actually solid. The surface of the MSI ThunderStorm is so large I never find myself running out of pad real estate. 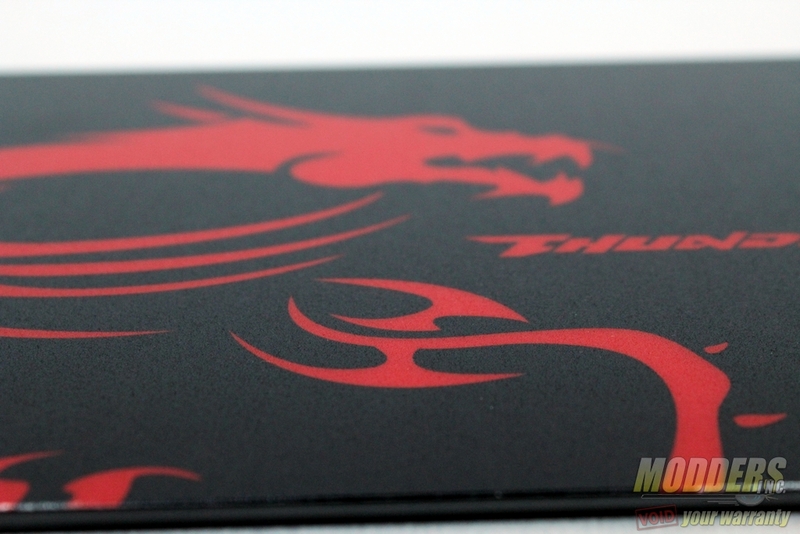 This is what I feel the first mouse pad should have been. 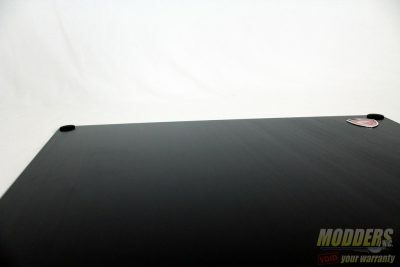 The “speed” side is made of a hard plastic surface. 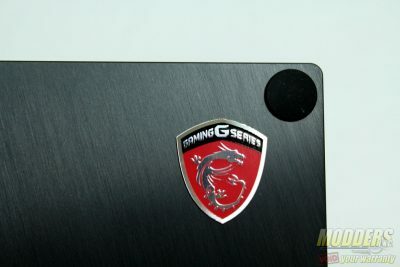 This surface is definitely the more graphically impressive surface since the plastic allows MSI to put their signature Gaming dragon logo. This will definitely be a head turner at any LAN party. 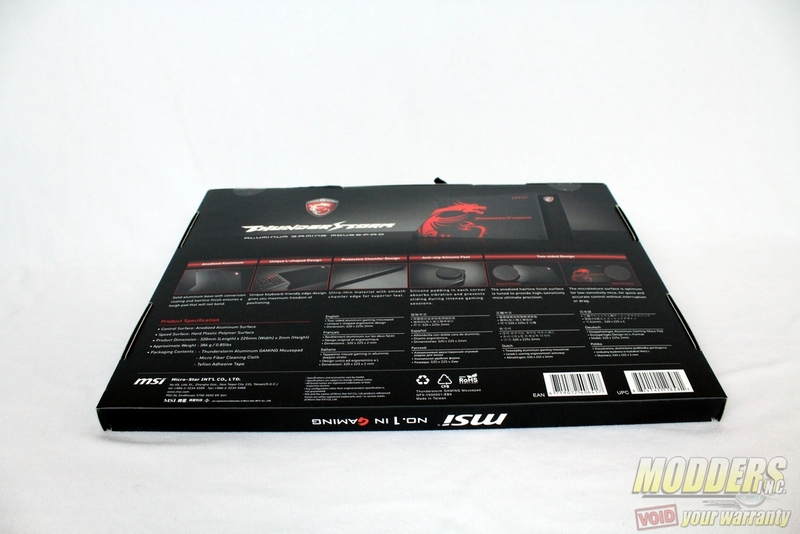 Even though the plastic side of the MSI Thunderstorm is for lower quality mouse with lower dpi, it feel natural and well built. One thing I should note about this mouse pad is that the mouse you choose may limit you to using only one side of this mouse pad. During my test with a Logitech M510 wireless mouse, I noticed I was unable to use my mouse on the aluminum side since my motion was not able to be tracked, but the plastic side worked just fine. I then tested this mouse pad on a Razer Naga 2012 mouse and I am only able to use the aluminum side reliably. 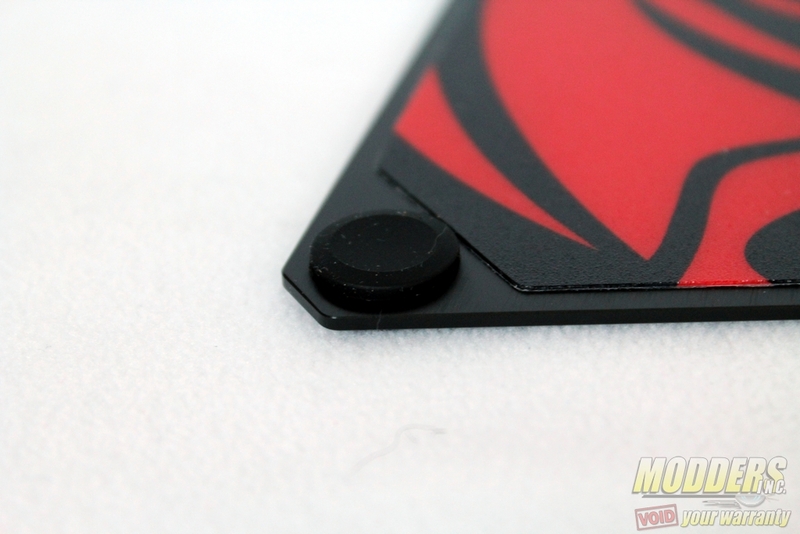 The plastic side will only track on certain parts usually on the red portion of the graphics. Laser sensors in general are more finicky with reflective and lighter colored surface (like glass or in this case, aluminum) and both the M510 and Naga are laser sensors so its not really surprising that it did not track completely. In this case, it is not so much directly about low and high sensitivity on the plastic side but more to do with the sensor capability. 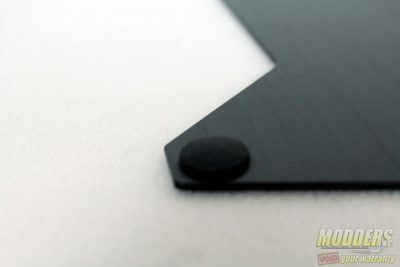 The synthetic/plastic side is more uniform so even lower resolution sensors will have greater success of tracking (even non-laser sensor like optical) because the fidelity of the surface being read is not as varied as it is on the aluminum surface (which has a more organic, random distribution of texture than the synthetic side). 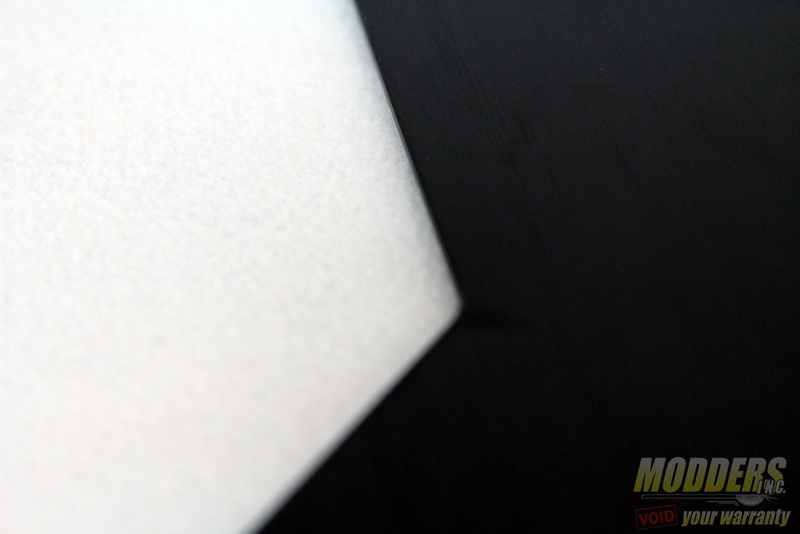 With higher sensitivity mice, the varied surface movement means the mouse sensor has to be really good to be able to interpret those surface changes in the aluminum side fast and accurately. 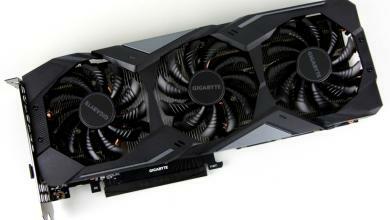 The synthetic side is there as a sort of fail-safe option that has wider compatibility. 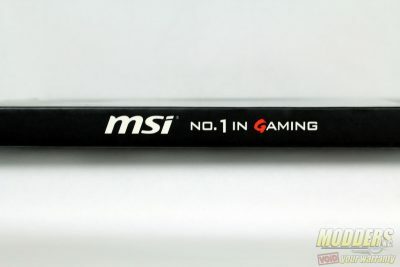 After adding MSI’s Nitoflon tape, I didn’t notice much difference, but it doesn’t make my mouse movements any worse on my Razer Naga. 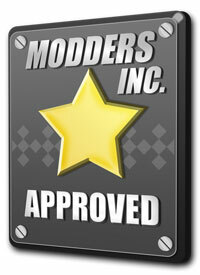 I will keep this Teflon tape in place to prevent wear and tear on the rubber feet of my mouse. If you happen to run out of this tape, there are vendors online and possibly hardware stores that sell Nitoflon tape that can be a substitute. 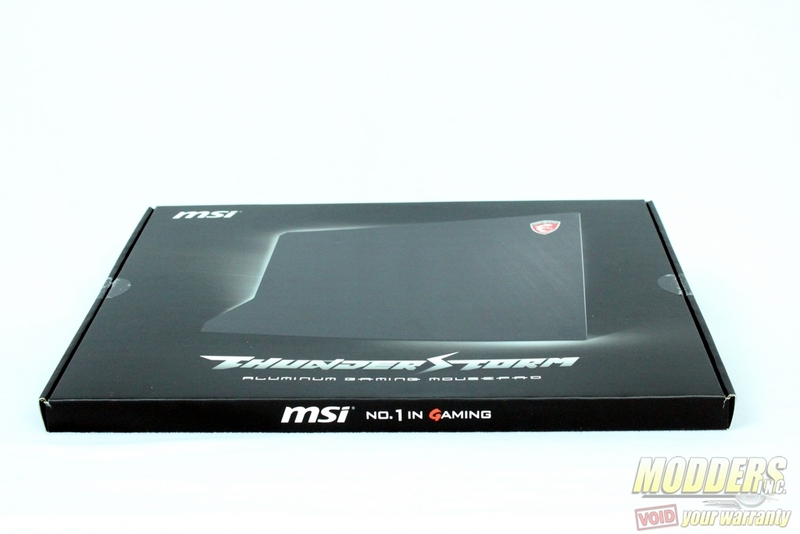 The MSI Thunderstorm is a great mouse pad for gaming and productivity. The silicone feet alone would be reason enough to get this mouse pad because even the best mouse pads tend to slide on certain tabletops I’ve used. 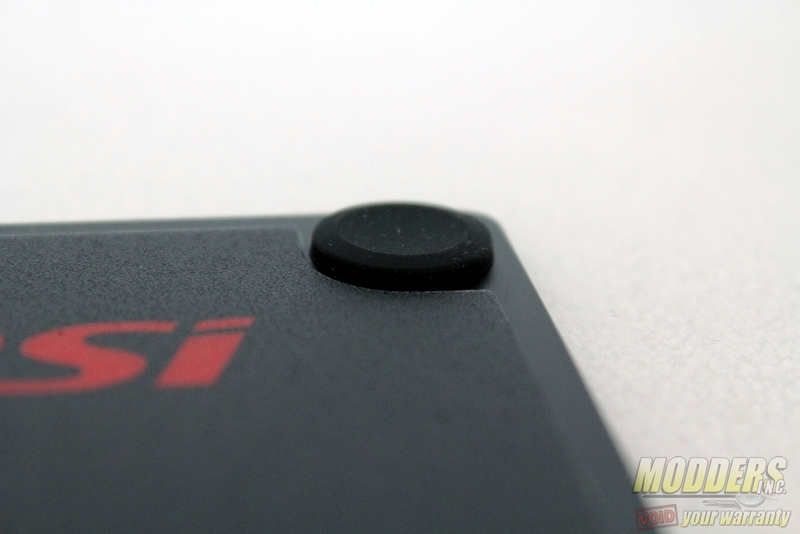 The MSI ThunderStorms feel like you’re gliding on a friction-less surface regardless of which side your mouse is compatible with. If this is not the case, the thoughtfully included Nitoflon tape will remedy this problem. If I have anything negative to say about this mouse pad it would be that in the unlikely event you need to use the upper right corner of the aluminum side, the mouse might run into the “gaming series” badge. 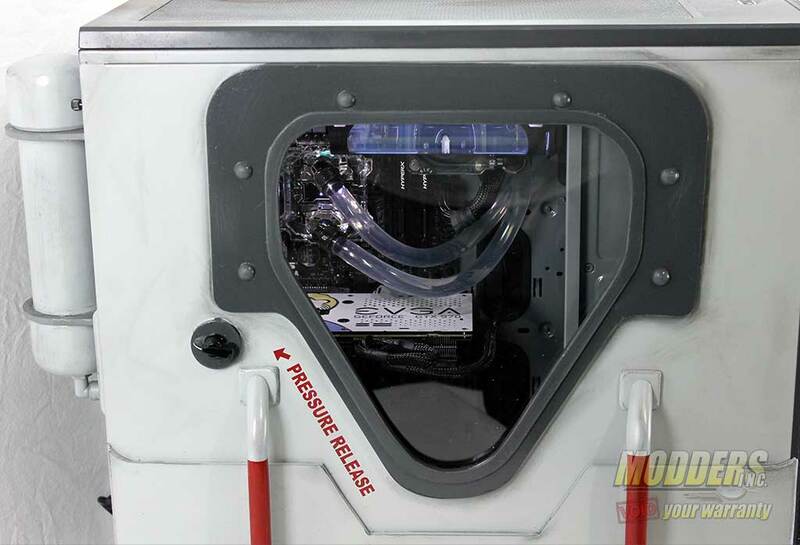 I really wish this was an optional add on or was somehow flush with the aluminum in some way. 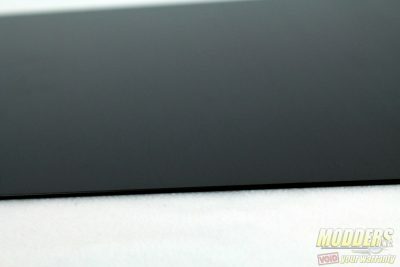 The MSI Thunderstorm is not the only aluminum gaming pad on the market and there might be other aluminum mouse pads that are on par or better. Given this fact, I don’t think many buyers will regret purchasing the MSI ThunderStorm. This is a solid mouse that feels so natural I forgot it was even there the majority of the time.